In stock - low quantity. Order in the next 9 hours, 53 minutes and it will go out today! Why do magicians call some tricks "classics"? What makes these tricks different? And what makes them so suitable for children? Classic tricks are not pipe dreams they have withstood the test of time, proving that they have really strong qualities which appeal to children. Until relatively recently, there were no such tricks specified as children's tricks... many magician's programs have been made up of these classic tricks you will see on this DVD. With the advent nowadays of so many tricks geared to children, we thought it would be a great idea to re-visit some of these forgotten gems and show just how suitable and magical they could be in YOUR routine. Routines: The Vanishing Cane, A Thumb Tip Silk Vanish, Miser's Dream, Torn and Restored Newspaper, Twentieth Century Silks, The Egg Bag, Linking Rings and Sympathetic Silks - all of these are covered on this DVD. In fact, almost every single trick in the show is a "classic". David Oakley is a long-standing professional children's and family entertainer. 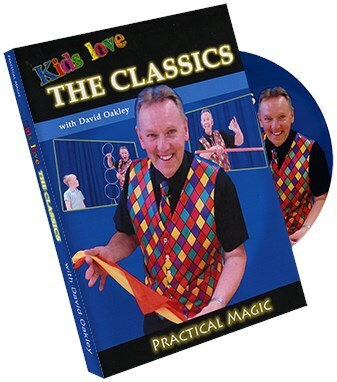 On this DVD he shows why these classic tricks reached celebrated status and why they deserve a place in the shows of anyone who entertains children.